Is it going to be a white Christmas? Probably not – it seems to only ever snow at weird times like March these days, never in December when I swear it’s supposed to, and when I’m sure it used to. I can’t wait to take baby H out in the snow for the first time, but I reckon we’ve got a few months to wait before that happens. Worst comes to worst we are going skiing with Mr H’s family in Feb, so fingers crossed that’ll be snowy otherwise it’ll be a bit of a wasted trip! Not that I plan on skiing though – I did it once on a family holiday years ago – on the first day we all started in the beginners class and by day two they had to create a new class for my dad and I because we weren’t good enough to even be with the beginners. By day three I retired from skiing and sat in cafes all day instead, which is exactly what I plan on doing on this holiday. Can you après-ski if you don’t ski? I sure hope so. Anyway, I digress. 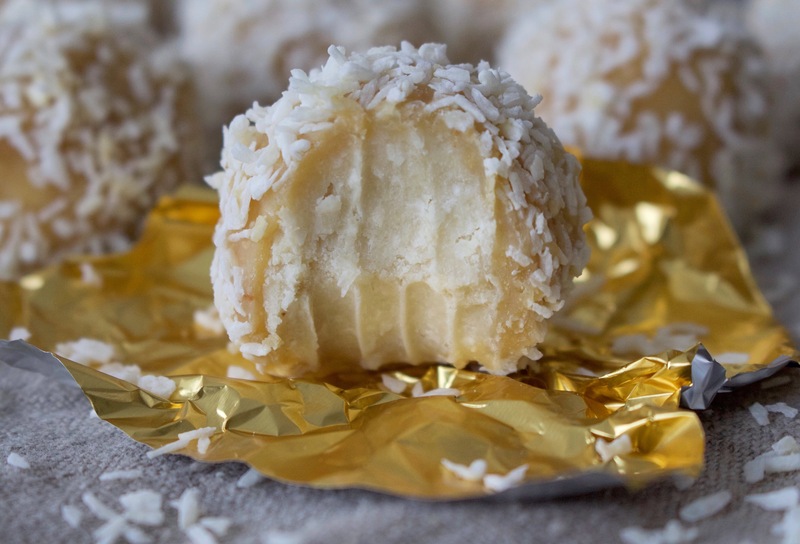 If there’s not going to be snow on the ground this Christmas I thought I’d make snow in my kitchen instead, in the form of these white chocolate snow ball truffles! 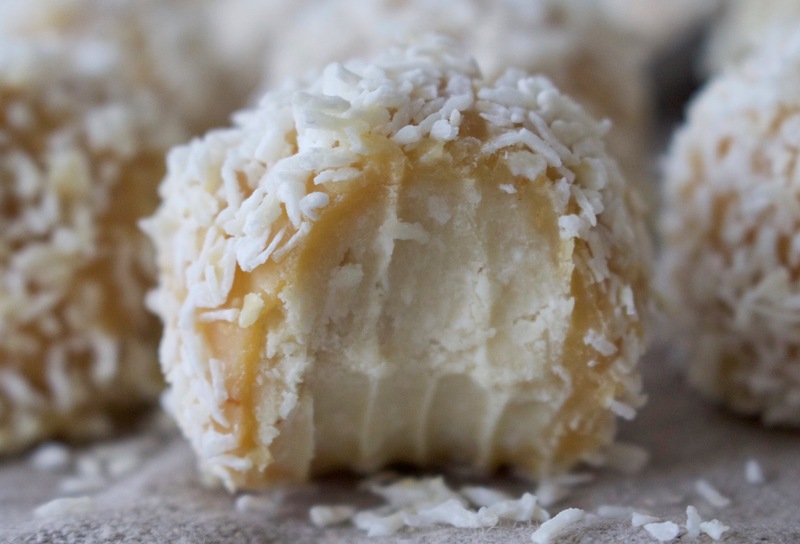 They’re super indulgent and tasty, and if you’re a fan of white chocolate and coconut then you’re in for an absolute treat! 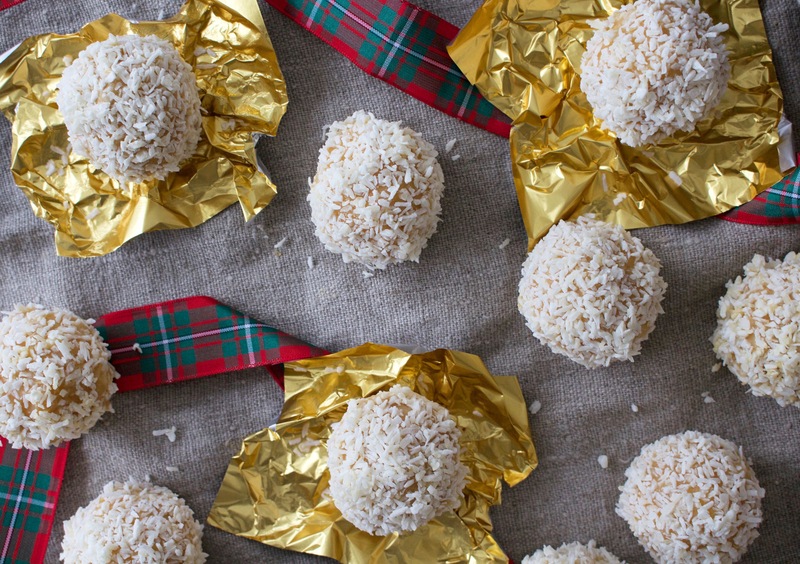 But I’ve got to warn you, if you make these there’s snow way you’ll want to share them! Sorry. Recipe coming right up! These are superdy duperdy easy to whizz up! First, melt the cacao butter in a bowl over a saucepan half full with water on a medium heat (or cheat and use the microwave) then pour this and the other ingredients into your food processor and blend until you have a sticky smooth mixture. Shape this into balls and place them in the freezer to set for about an hour. To make the white choc coating, melt the cacao butter as above then add to a bowl and mix in the maple syrup and vanilla, then the cashew butter. Stir it all together well and once smooth, remove the balls from the freezer, dip them in it one by one (I usually give them a couple of coats to make sure they are extra chocolatey) and cover with desiccated coconut. Please can you tell me what you mean by ‘coconut cream’?